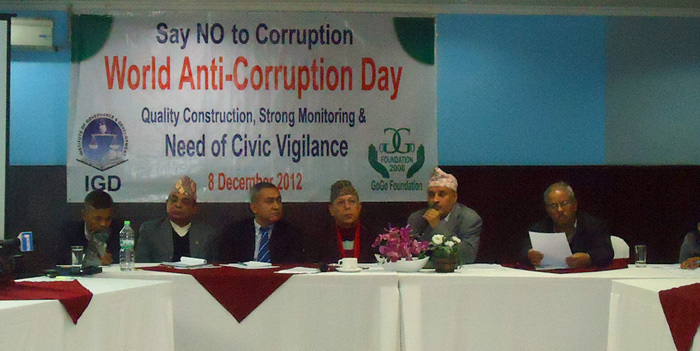 GoGo Foundation jointly with Institute for Development and Governance organized a seminar on Quality Construction, Strong Monitoring & Need of Civic Vigilance on 8 December 2012. The event was organized to mark the World Anti-Corruption Day with thematic focus on corruption in the construction of development infrastructures. Former government secretary Tana Gautam presented a paper on the theme while Chief Secretary Lilamani Poudel shared his experiences and further commitment to control corruption. Mr Krishna Hari Baskota, Secretary at the Prime Minister's Office, Mr Tulasi Prasad Sitaula, Secretary at the Ministry of Physical Planning, Works and Transport Management, Kishore Thapa, Secretary at the Ministry of Urban Development and Bimal Wagle, Chairman of Public Enterprises Directorate Board, had shared their experiences and highlighted concerted need and challenges in fighting corruption in the construction sector. The program was attended by around fifty participants from different sectors. GoGo Foundation in joint efforts with the District Administration Office (DAO), Kathmandu, prepared and printed out ten thousands leaflets and two radio jingles on consumer rights. These leaflets and radio jingles were handed over to Mr Chudamani Sharma, Chief District Officer (CDO) of Kathmandu amidst a program at the DAO. The leaflets titled ' Are You Aware of Consumer Rights?' & 'What Are Those Prohibited Acts on Public Goods and Services' were distributed among consumers at different locations of the valley. Similarly, two radio jingles have been broadcast from different FM radio stations of the country. This small collaborative effort between GoGo Foundation and District Administration Office was instrumental in creating synergetic effect on creating mass awareness among consumers on different aspects of the consumer rights and legal dimensions envisioned by the Consumer Protection Act. Mr Kedar Khadka, President of GoGo Foundation, handed over leaflets and radio jingles to the CDO for wider dissemination.